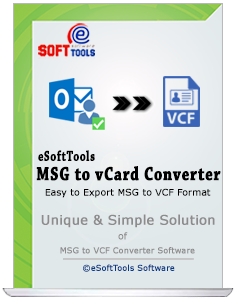 eSoftTools Outlook MSG to vCard Converter Software is an exhaustive and successive solution for extracting MS Outlook Contact MSG files in order to export outlook contacts to vcard file. Software process batch conversion of Outlook MSG Contacts to vCard (.VCF) format with whole preceding data. Converted vCard files supported i-phone, smart phones, Outlook Express, Lotus Notes, Apple Mail, Outlook etc. Tested over 50,000+ MSG Contacts to VCF conversion at a time. A new way to handle single / batch Outlook MSG Contact Conversion to vCard format. Convert both ANSI & UNICODE MSG files to VCF file. Installation of MS Outlook is required for MSG to vCard Conversion. Generate individual vCard (.vcf) file for each MSG Contact file. Add unlimited MSG files for bulk conversion in VCF file.. 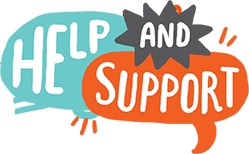 Supports Windows 10 & all below versions - Windows 8.1, 8, 7 etc. Software help users to swiftly convert Outlook contacts to VCF file in single shot of conversion. This tool supports to export outlook contacts to vcf in batch mode with unlimited number of outlook contacts to vCard conversion. Without any alteration, software convert MSG file to vCard file with preserving all types of Images, Styles and formatting. Contact pictures are also maintained by this MSG to VCF converter software, So don't worry about anything and hasselfree convert Outlook MSG to VCF file. MS Outlook MSG to VCF Converter software permit users to load MSG file folder-wise for conversion in huge amount and continue the MSG file to vCard conversion. You can select the MSG file one another after in batch and export the entire selected folders into vCard file. MSG to vCard Converter Software is the right way to recover and convert contacts of MSG file to vCard file along with all the related details such as- Name (first, middle, last), Number (phone and mobile), Address, Email id etc. This is one of the best advantage of MSG to VCF Export software. Folder-wise MSG file addition clearly defind this tool has bulk conversion of MSG to vCard Conversion. This Outlook MSG to VCF Converter free tool delivers the same outcome as you expacted. You can convert any size of MSG file into vCard format using this application because the tool has not restriction with file size. This one is best feature for users for doing the well conversion of any large MSG to vCard file. 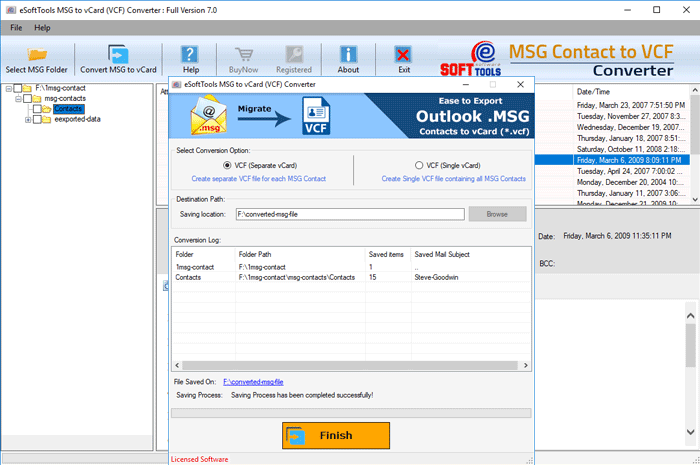 MSG to VCF Converter Software is well matched with all versions of outlook MSG file both ANSI and UNICODE for conversion data of MSG to vCard file. It supports MS Outlook versions 2016/2013/2010 to 97 (32 and 64 bit). Demo Limitation - The Demo Version software demonstrate you complete working process and facilitates to export 10 MSG Contacts to VCF file. 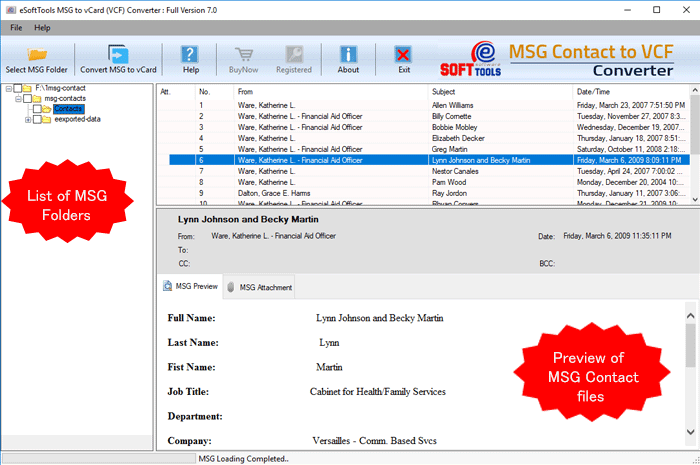 Select MSG Contacts files from your computer. Can I add and load multiple MSG files for conversion into vCard format using the Tool? This software allows adding and loading unlimited MSG files at a time for doing well migration of Outlook MSG to vCard file. Is there need of installation MS Outlook before conversion MSG to vCard? Yes, if you want to convert MSG to vCard using this program then before start the conversion process, just install MS Outlook on your machine because software required the environment of Outlook. Note: MS Outlook should be configured with active OR dummy profile. I want to convert individual contacts items of MSG file to vCard format so will the software execute this functionality? Yes, you can select either individual contacts or multiple contacts of Outlook MSG items and convert them into vCard format using this tool. My MSG file is too large that all need to convert into vCard format so can I do this task with tool? Don’t worry for the size limitation of MSG file because this software doesn’t require size limitation for the conversion. Any size of MSG file you can convert into vCard format. Will software supports UNICODE Outlook MSG file for performing the task of conversion into vCard format? Earlier I didn’t believe purchasing any online products but as I used eSoftTools MSG to vCard Converter Software, it changed my thought and using this application I successfully recovere and convert MSG contacts to vCard (VCF) format. Thanks a lot.. This Outlook MSG to vCard Converter Software solved my biggest trouble, I was not able to get a solution for conversion of MSG to vCard file but one day I found this and successfully saved all my outlook MSG contacts to vCard format. Thanks a lot. If I speak truth I have no technical skill I am fresher but I used this application and got positive result. When I was using the software I didn’t face difficulty even very quickly I understood the conversion steps…..thanks you so much. Thanks you so much for developing this software, the steps of conversion was very clear and smoothly I followed them and successfully convert/export MSG Contacts to VCF included all contacts information i.e First Name, Last Name, Phone Number, Email Address, Home & Office Address etc..